Kit DesLauriers may be hard-pressed to come up with an answer when someone asks, "Can you top this?" That's because she skied from "the top of the world," the summit of Mount Everest, in mid-October. DesLauriers was the first woman and first American to do it. She also became the first person to ski from the top of the highest peaks on each continent, known as the "Seven Summits." She marked all those "firsts" 37 days before her 37th birthday. DesLauriers scaled Everest with husband Rob DesLauriers, photographer Jimmy Chin and a team of 11 others. Rob and Chin also skied from the summit. They first skied to the top of the Hillary Step, a nearly vertical, 40-foot drop-off at the 29,000 foot level. The next day, they skied down Lhotse Face, a 3,700-foot wall of glacial blue ice. DesLauriers, a two-time women's world free-skiing champion, told co-anchor Tracy Smith on The Early Show Wednesday she decided to try the Everest adventure because she'd "always been a mountain climber and a skier. When I was in the Himalayas in 1998, I had this epiphany that I always wanted to bring my skis with me from then on. On that trip, I didn't have my skis. So, I've made it a focus since then to make sure I could ski down any mountain I chose to climb and, after competing on the world free-skiing tour for two years, I had another epiphany, where I sat quietly with myself and thought abut what it was I wanted to do next, and I dreamt up this idea of going around the world and climbing and skiing the Seven Summits." Asked by Smith how he felt about Kit trying the Everest climb/ski, Rob responded, "She invited me along, so it was OK. And we actually met on a ski mountaineering expedition in Siberia, so we shared this love. It was wonderful for me, because she set this goal for herself and it became something we could do together. It was very exciting. She's very inspiring to me." Kit admitted they were scared, but, "I know it's really healthy to be scared. We wouldn't be here and be able to speak with you about it if we didn't have some level of, you know, being scared during the trip. But that's a healthy thing. That's what helps you to get down. It's really important to just believe in yourself, believe in something. And for us, it was believe in ourselves, and believe in each other and believe in our teammates." Rob recalled that, "At one point, I said, 'Kit, how are you doing?' She's like, 'I'm scared. I don't wanna die.' And I said, 'Good.' And skied away. Because you have to just learn to trust each other, and ski down. There's nothing you could do. We had to get down at that point. It's a mile of steep ice that we were on." 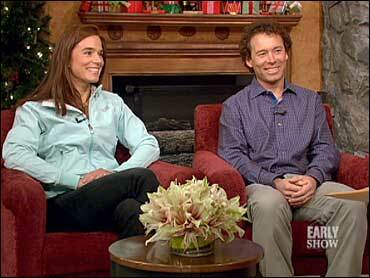 Kit said having a mantra helped, "especially down the Lhotse Face. It was a 45 to 50-degree (angle), sustained, really steep, difficult conditions, very icy and a couple football fields wide, for sure, of (several thousand) vertical feet. If you made one mistake, you'd be unrecognizable at the bottom of the face. And it came to me from somewhere — like your life depends upon it, 'Turn!' And I actually said it out loud most of the time. 'Turn, turn, turn, turn, otherwise, you know…"
Rob described a very close call at the Hillary Step: "We were trying to repel and ski down that, and I ran out of oxygen, which we all did at some point, but right during the most difficult time of that. And I was exerting myself a lot. And at altitude, you can breathe without oxygen, but you can't really exert yourself. And so, I passed out for a little while and Kit saw me sort of slumped on the rope and she took care of herself. She made all the right decisions. It was an amazing experience, and we are here both today." Sherpas came to his aid. "Well," she said, "Mount Everest is the highest in the world, and then the Seven Summits, for a lot of people who endeavor to climb them, that's it, the starting and ending point of their mountaineering career. It's not been that for me. I've spent my life climbing mountains, and I continue to." Among those on the expedition were Everest veteran Dave Hahn and a team led by Wally Berg of Berg Adventures. It was financed by outdoor apparel and equipment maker The North Face and Balance Vector, described by its Web site as "a diverse collection of athletes, artists, filmmakers, musicians and writers from around the world" who back environmental, youth and cultural causes. Before the expedition, there had been only 15 ski-descent attempts from the Everest summit. The DesLauriers and Chin live in Jackson, Wyo. For more on the expedition, click here. To see a slide show of Chin's exclusive photographs of the expedition, click here. To hear a podcast of an interview of Chin by Outside Online editor Anthony Cerretani, click here.